There we were yesterday, walking into a supermarket in Gourdon, our small shopping list in hand, when we were stopped dead by a large yellow poster in the window. Strawberries! Gariguettes! From France! In other words, folks, the first home-grown strawberries of the season. 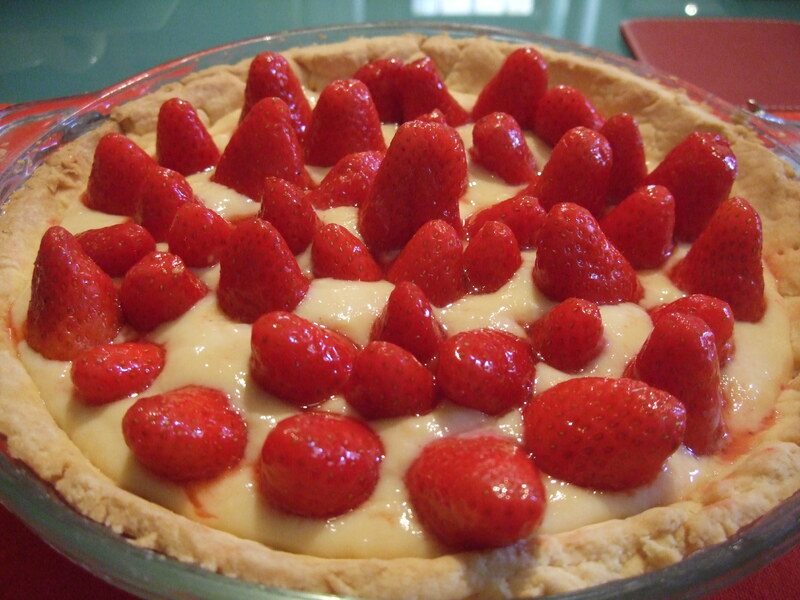 So my wife Jan bought two containers of them, vowing to make a strawberry tart (tarte aux fraises) for lunch today. And she did, with some help from yours truly. This morning she made the gluten-free dough, and got it into the refrigerator to chill, but then had to leave for a long walk with friend Samantha and her two children. That left me in charge. Yikes! Tarte aux fraises, à la GDA. We each had a large slice of the tarte, after our modest Sunday lunch of roast leg of lamb, whipped potatoes with crème fraîche, and sweet-and-sour red cabbage, with a bottle of Spanish rioja. This entry was posted in Bicycling in the Dordogne, French food, Life in southwest France and tagged food, Gariguette strawberries, roast leg of lamb, strawberries, sweet and sour red cabbage. Bookmark the permalink. If you are what you eat, then you are now a tarte!